Even through the rain, the colors of our rainbow shone brightly at Brooklyn Pride 2009, with performances by LGBT artists, speeches and appearances by public officials, and, of course, the Brooklyn Pride Parade from Prospect Park up Seventh Avenue in Park Slope. 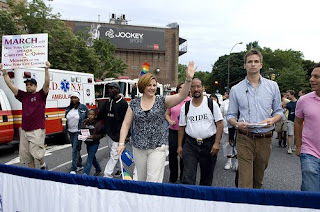 Here I am marching in the Parade with (above) New York City Council Speaker Christine Quinn, and aide Erik Bottcher. It was great to step off and show our Pride! Speaker Quinn was, as always, real trooper. We marched between the raindrops all through Park Slope, and the crowds were out in full force. No clouds could darken our Pride! 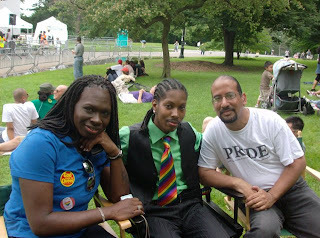 This is Xavier Raye, who put on a stellar show at Brooklyn Pride. He was a crowd pleaser, belting out several songs with a vibrant, dynamic performance! 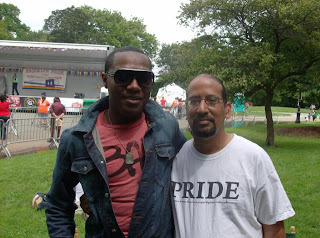 Here's Maurice Runea and Pride Show co-host Stefon Royce at the Brooklyn Pride edition of The Maurice Runea Show. I was loving that Rainbow tie! I had a blast at Brooklyn Pride, weather notwithstanding. 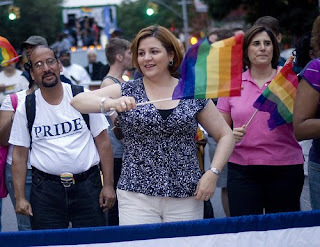 It was wonderful to once again celebrate our Pride and diversity with the NYC LGBT community as Pride Month rolls along! This event was kickin' all along Prospect Park West, with vendors of every description adding to the festivities. Always proud, always Brooklyn!